The Alpine stitch is a stitch I have been searching for a long time. I am serious. I found a beautiful hat for sale using this stitch and I could not find anyone who knew what the stitch was. The Alpine stitch just had the most beautiful looped raised texture and the rows were off set from each other. I mean I was really in love and everything I tried just did not look right. 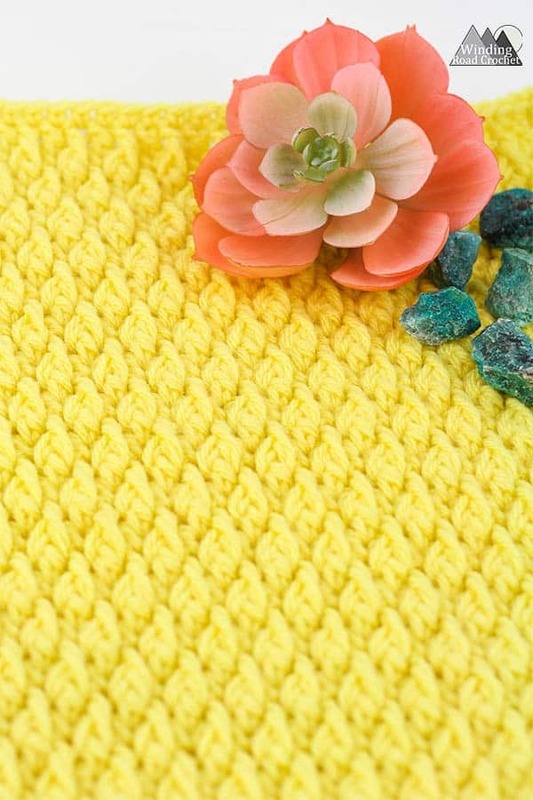 Well I have finally discovered the secret to the Alpine stitch and in this photo and video tutorial I will share with you how to make this beautiful stitch. One of the reasons I had so much trouble finding this stitch is because this stitch goes by quite a few names and no one name seems to be the most popular. I have seen this stitch called The Ripple Stitch, The Alpine Stitch and the Alternating Double Crochet and Front Post Stitch (a bit of a mouth full). I prefer to use a loose Front Post Double Crochet stitch in this pattern, but I have also seen it worked with a Front Post Treble Crochet. Gauge is determined by using the Alpine Stitch. When working the Alpine Stitch you will want to any even number of chains. Please note that I do not count my turning chain as a stitch. For the Large (Blanket) 12 inch Swatch we will chain 40. For the Medium (Book) 8 inch Swatch we will chain 26. For the Small (Block) 4 inch swatch we will chain 16. Please note, if you use an ad blocker they may block the video tutorials. Chain 16, 26, or 40 depending on the size of swatch you want to make. R1: Dc in the 3rd Ch from the hook and each Ch across. R2: Ch1, turn, Sc in each stitch across. R3: Ch2, turn, Dc in the first St, *FpDc around the Dc below the next stitch, Dc in the next Stitch* repeat from *to* until the end of the row. Note: In Row 3, your Front Post Double Crochet will be worked around the Double Crochet of the first row (pink row in the photos). You will want to keep your tension very loose to create the pretty looped texture of this stitch (Photo 2). I will pull the loop until it is even with the top of the Single Crochet Row, (shown in grey) then complete the Front Post Double Crochet. R4: Ch1, turn, Sc in each Stitch along the row. R5: Ch2, turn, work a Dc in the first 2 stitches, *FpDc around the Dc below the next stitch, Dc in the next Stitch* repeat from *to* until the last stitch of the row. Dc in the last stitch. To continue working this stitch, simply repeat Rows 2-5 until your project is as long as you would like it to be. To make a 12 inch square work until you have a total of 33 rows. To make a 8 inch square work until you have a total of 23 rows. For all three projects for the March Texture Madness Crochet A Long, it is helpful to have a single crochet border around the edge of your sample. With this stitch I found it easiest to work one single crochet into each stitch on the top and bottom rows. For the sides of the sample swatch I alternated working 2 Single crochet into the side of a Double crochet in one row, and only 1 Single Crochet into the side of the Single Crochet of the next row. Written pattern, tutorials, graphs and pdfs of the Alpine Stitch Tutorial are copyright Windingroadcrochet.com. Please do not reprint or repost this content as your own, but please feel free to share this link with others. You can find more information on sharing my work with others in the Terms and Conditions Page. Sorry but that “music” is not good for hearing impaired or those with brain injury etc… Silence is golden! I am sorry that they music bothers you. I prefer using the music to cover up any possible background noise. I will consider turning it down further in future videos. I also find pure silence unnerving during times that I am not talking. I have trouble with music also. I am sorry for that. I tend to hat silence and during the areas where I speed up the video there is silence. I did turn down the music in future videos. I love to crochet and I love learning new stitches, patterns and ideas!! I also love learning new techniques to help me become better at my craft. Thank you for making a left handed video, which is done quite well, I might add. I have always struggled to learn new techniques because I could not find anyone that could teach me due to being left handed. I am excited to learn these new patterns that you have explained and “shown” so well in your videos. I am happy to do it! I would like to save your video. I use iPad and cannot locate a place within the video or under it to save it. Is this on YouTube? Thank you. It is not currently on youtube but I am due to add something to youtube. I will add it this week. I am going to make a blanket for my 3 year old granddaughter with this stitch, I love the way it looks and feels! I have only been crocheting for 4 months but with your video (for lefty’s) I knew I could do it! Thank you!! ? That really makes my day. I have seen this as a blanket and it is beautiful. Could you comment on how many FPDC there should be in the finished row. Not sure if I’m going into the right stitches as mine seems to look different. I’m not sure which sc to go into between the FPDC. Like you, I have loved this stitch for a long time and would love to master it! Which size did you make or what did you use for your starting chain?